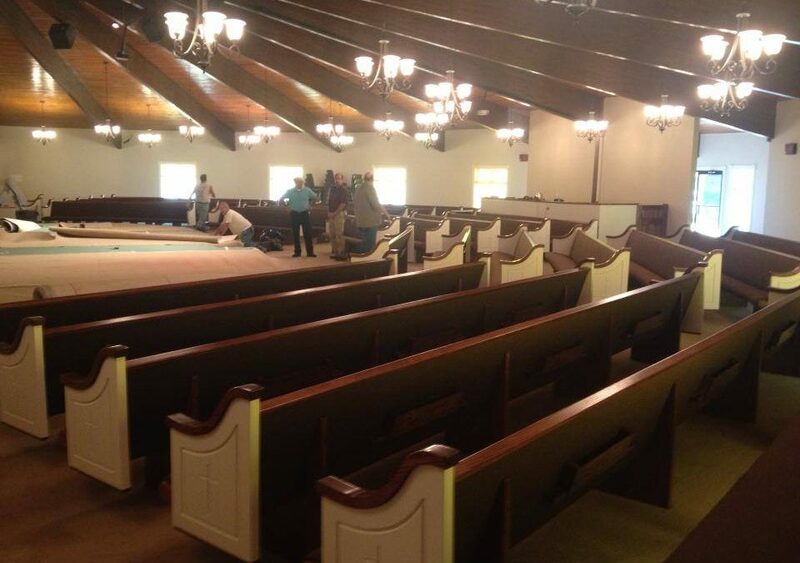 We installed church pews in the Church of God in East Prairie, Missouri, a few weeks ago. East Prairie is a small town but you might remember the name from last February when a large 4.0-magnitute earthquake hit the town and it was felt as far away as North Carolina and Georgia, according to the United States Geological Society. East Prairie, however, is also known for the Tour de Corn bicycle race hosted there during the Sweetcorn Festival and their moment of fame when the movie The Intruder was filmed there. What we loved most about East Prairie was the unique design of the Church of God. The sanctuary of the church is semi-circle shaped, giving everyone in the church a great view of the altar. Unique churches like this could opt for curved church pews but the Church of God decided to use conventional church pews with straight lines instead of curved ones. There are advantages and disadvantages to both types of church pews in a round church design. 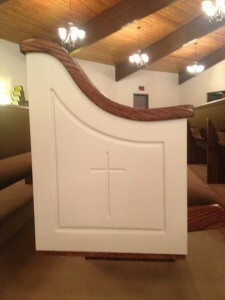 There is a type of church pew that can be curved to match the shape of a round sanctuary like that of East Prairie’s Church of God. Called radius curved pews, they optimize seating, allowing more people to be seated in the sanctuary. 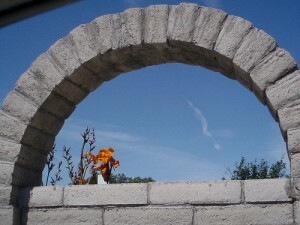 However, pews in the shape of a traditional archway made with stone block, like the one at right, the blocks are flared towards the outside of the curve and narrowed at the inside. Because of this shaping, radius curved pews squish knees together and can be very uncomfortable. Straight pews don’t have this problem of squishing your congregation members together so that space is wasted because of narrowed seating. Standard straight pews are much less costly than curved church pews and can be padded, unlike curved pews that are very difficult and very costly to cover. This leaves the wood exposed and once it’s worn out, it can’t be easily replaced like cloth covering and padding. Standard pews also provide a more traditional look than curved or radius pews and can have beautiful pew ends customized for your church. We added an elegant design on the end of the church pews we installed in East Prairie’s Church of God that give a traditional look to a unique space, making it more approachable for newcomers. If you have a unique church space like this beautiful church, we can help develop a completely custom solution for your church so you get the most out of your church pews. Request a free quote today!